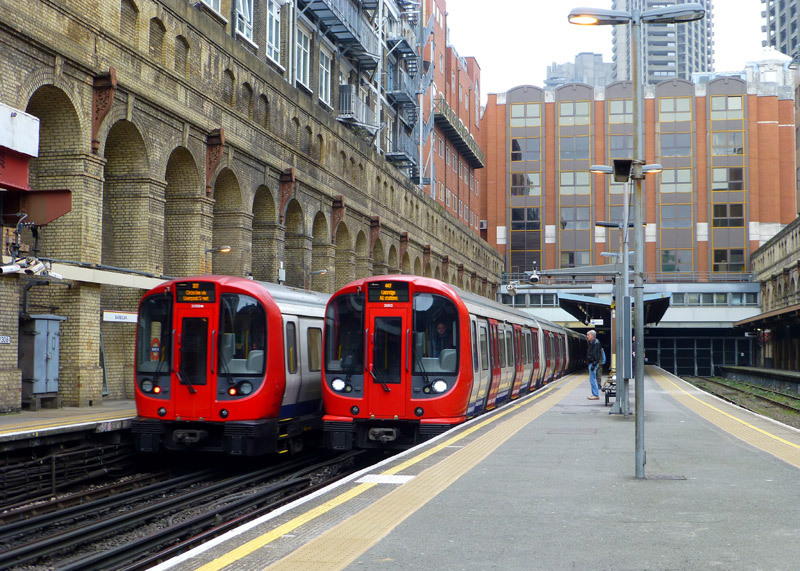 The Hammersmith & City Line uses S Stock ‘subsurface’ trains, seen here (above left) at the 1871 platforms at Westbourne Park station. These trains have 3 sets of opening doors per car, air-conditioning and internally are of a walk-through design. S Stock Variations: Although they all look the same there are two different types of S Stock trains. The S7 variant have 7 cars with only longitudinal seating. These are used on the Circle, District and Hammersmith & City Lines. The S7+1 variant have 8 cars with only longitudinal seating. 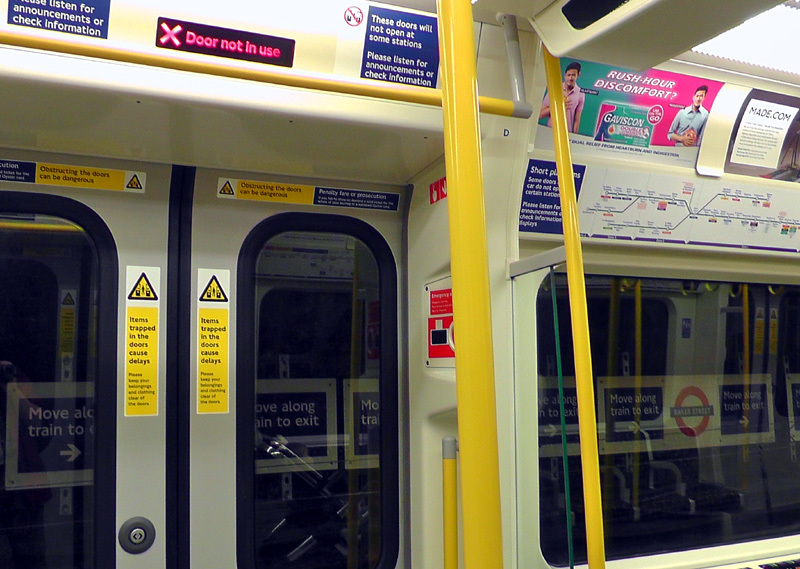 There are only a few of these trains which are used on the Metropolitan Line. The S8 variant have 8 cars, a mix of longitudinal and facing seats and are used on the Metropolitan Line. Hammersmith & City and Circle Lines (right). - because they look at the wrong map! S Stock trains show the line name and destination on their sides. Click map to see larger version in a new window! 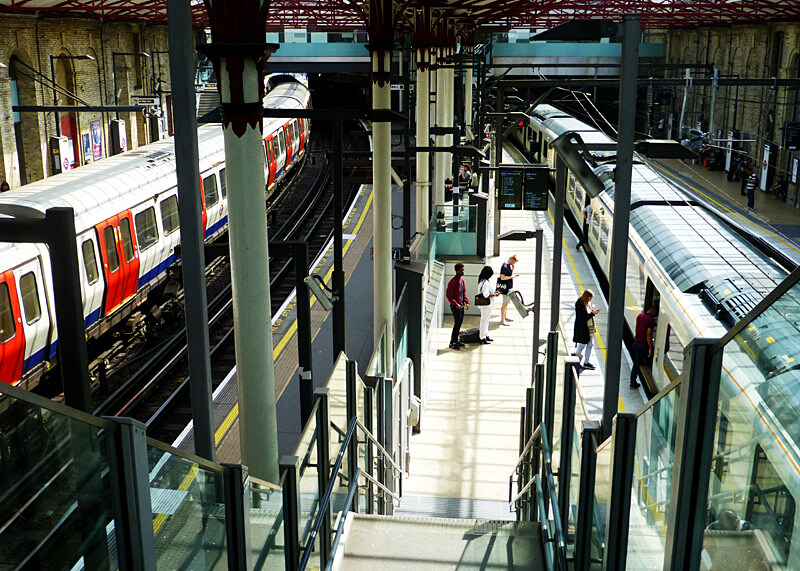 Almost entirely below ground in central London, Edgware Road, Farringdon and Barbican stations are in open air. At Liverpool Street one end of the platform is in open air. The tunnels between Kings Cross and Barbican stations include some short open air sections which date from the days of steam trains when ventilation openings were needed to allow the smoke to clear. In west London open air between Hammersmith & Paddington, except for the short flyunder below the Great Western Main Line between Westbourne Park and Royal Oak stations. In east London open air at Whitechapel and then from Bow Road to Barking. Information for people who are happy to travel on trains which are above ground but experience claustrophobia when in tunnels. Most of the tunnels used by Hammersmith & City Line trains are wide enough for two tracks (ie: a train in each direction), however there are one location which has narrow single track tunnels. 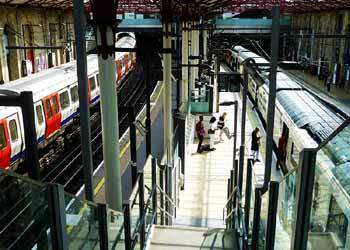 * This is at Kings Cross St Pancras station - the platforms plus station approaches / exits. Until 1988 this service was officially part of the Metropolitan Line (albeit a separately operated branch) and at some locations might still be advertised as such. 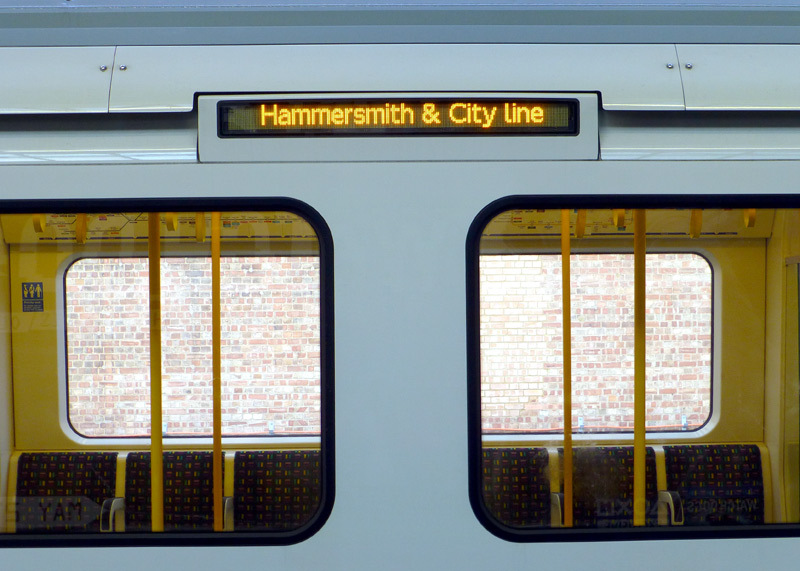 The name 'Hammersmith and City' is taken from the Hammersmith and City Railway (H&CR) which was jointly owned by the Metropolitan and Great Western Railways. Central London: The Hammersmith & City Line operates along the entire length of the first section of the Metropolitan Railway which opened in January 1863 and extended from Paddington to Farringdon Street (nowadays just known as Farringdon) via Baker Street station. Over the years several of the stations on this section of railway have changed their names, these include Moorgate Street / Moorgate, Aldersgate / Barbican and Gower Street / Euston Square. 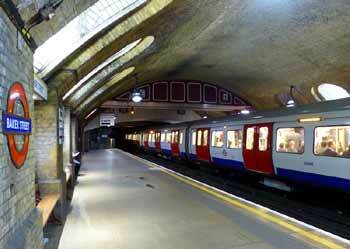 Baker Street is of course one of London‘s most famous stations. Hammersmith & City (and Circle) Line trains use the original 1863 platforms which are located just below the Marylebone Road and numbered 5 & 6.They have been restored to as near their original condition as possible. However since the original fresh air portals which allowed daylight to enter the station (and steam engine smoke to escape) have been covered over they have been fitted with electric lighting so as to help recreate this effect. The platform walls feature many plaques showing old plans and photographs of the station as it was many years ago. Baker Street has the most platforms that are served by London Underground trains in all London. Four platforms are used by Metropolitan Line trains, two platforms by Hammersmith & City and Circle Lines trains plus four deep level tube train platforms - 10 in total! Just outside the front of the station there is a large statue of Sherlock Holmes which commemorates the fictional detective's association with 221B Baker Street. The platforms at Great Portland Street also comprise much historic brickwork and heritage style lighting. There is also a daylight / ventilation portal at one end of the station. Although Edgware Road (subsurface) was an original 1863 Metropolitan Railway station, in the 1920's it was rebuilt to have four platforms. This was part of a plan to reduce congestion on the two track section of railway between Baker Street and Finchley Road stations by building new deep level tube tunnels from just to the west of Edgware Road station to just north of the present-day Kilburn station. However the planned new route was abandoned after new safety rules prohibited the compartment type of train that the Metropolitan Railway used on its main line services from travelling through deep level tube tunnels. 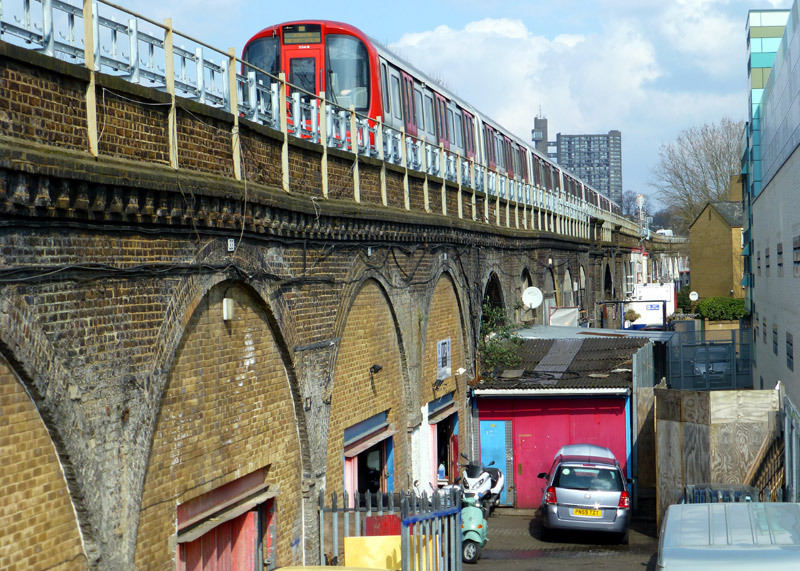 Instead a solution was found which included building new tunnels between Finchley Road and Baker Street stations as an extension to an existing tube line. The subsurface platforms at Kings Cross St Pancras date from 1941. For most of their length they comprise twin circular shaped tunnels with a side platform, thereby creating the ambiance of a deep level ‘tube’ train station. There is a photograph showing this on the Circle Line page. The route from here to Moorgate has four tracks, the other tracks are known variously as the Widened Lines or the City Widened Lines. 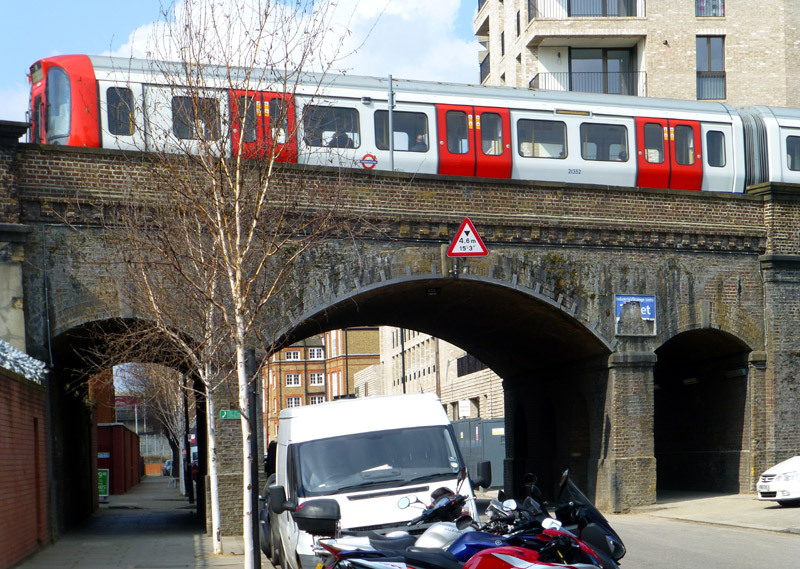 Nowadays some of this route is used by mainline trains as part of the Thameslink service, these can sometimes be seen whilst travelling between Kings Cross and Farringdon stations. Also visible is the remains of the westbound platform at the Kings Cross station which Underground trains stopped using in 1941. A wall prevents sight of the former eastbound platform and the platforms which Thameslink trains stopped using in 2007. The route between Barbican and Moorgate dates from 1965 when the tracks were realigned and placed in tunnels as part of an urban regeneration scheme which included the building of the Barbican complex. Moorgate station also used to be open air but is now under an office block. This station also has 10 platforms. Four of these are used by Metropolitan / Hammersmith & City / Circle Lines trains (two for through trains and two bay platforms), two platforms are for Widened Lines trains (no longer used) and four platforms are used by deep level tube trains (two as part of the mainline railway system). S7 and S8 Stock trains arriving at and departing from Barbican station (both trains are moving as when stopped here they fill the platforms). When first built this station had an arched roof but it was destroyed in WW2. On the right are the now disused Widened Lines - as detailed above. 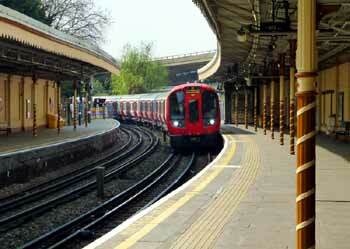 A Hammersmith & City Line S Stock train calls at platform 5, Baker Street station. The historic platforms 5 and 6 were part of the original Metropolitan Railway of 1863. There are more photographs from this station on the pages which look at the Metropolitan, Bakerloo and Jubilee Lines. Widened Lines: (This section includes some history as this helps explain some features of the present-day route). Because of the large number of trains from other railway companies§ which wanted to access London's Financial District the 1865 extension of the original Metropolitan Railway from Farringdon to Moorgate was built with four tracks, and a pair of extra tracks were added between Farringdon and Kings Cross St Pancras stations. §The railway companies included the Midland Railway, the Great Northern Railway and the London, Chatham & Dover Railway. Some of the trains which used the Widened Lines travelled the whole way from Kings Cross or St. Pancras to Moorgate, others only travelled between Kings Cross / St. Pancras and Farringdon - many of these trains were on services to / from various destinations in south London and crossed the River Thames on Blackfriars bridge. For a while there were also services from south London which went to Moorgate, only using the Widened Lines between Farringdon and Moorgate. In addition many goods (freight) trains used the Widened Lines, some of these served the various goods yards which were near Farringdon station, others were on longer journeys between north and south London. In the days of electric traction some Metropolitan Railway services that terminated at Moorgate also used the Widened Lines. But only when travelling eastbound, ie: towards Moorgate. Nowadays only the Thameslink service which links destinations to the north and south of London still uses the Widened Lines. However since 2009 they have only used the section between St Pancras and Farringdon stations. Prior to 2009 some Thameslink trains from the north of London travelled all the way from St Pancras to Moorgate. The reason why the section between Farringdon and Moorgate closed is that when Thameslink trains were lengthened from 8 to 12 carriages it was decided that the only way that the northbound platform at Farringdon could be extended to accept the longer trains was to build over the trackbed of the route to Moorgate. Extending the other end of the platform at Farringdon was not done because of a downhill gradient that was thought to be too steep for a station platform. This explains why Moorgate and Barbican stations have two disused platforms. Longer term plans are to re-connect the closed section of the Widened Lines to the Underground's tracks and use it as additional sidings, so it is unlikely that passengers will be able to travel along this section of track again. The Metropolitan Railway's main route and its City Widened Lines. Vine Street Depot belonged to the Metropolitan Railway. Smithfield Market Goods belonged to the GWR. The GNR was the Great Northern Railway. and on the Widened Lines a Thameslink Class 700 train. When looking at the historic information about the Metropolitan Railway it is important to remember that in those days it was just one of the many British railway companies. The MR saw itself as being a mainline railway that in every way was equal in status to its contemporaries. Therefore it would be wrong to think in terms of 'present-day' terminologies such as 'rapid transit', 'urban metro', 'subway', etc. Stations At Different Locations With The Same Names: For historic reasons three stations served by Hammersmith & City Line trains are ‘duplicates’. At Edgware Road, Paddington and Hammersmith different Underground trains call at identically named stations which are at separate locations a short walk from each other. At Edgware Road the Hammersmith & City Line, Circle Line and District Line trains use the former Metropolitan Railway station. The totally separate Bakerloo Line station with the same name is a short walk away across busy road junctions. At Paddington the Hammersmith & City Line trains (and Circle Line trains travelling to / from Hammersmith) use the suburban platforms (numbers 15 & 16) which are part of the mainline railway station and totally separate from the other underground lines. 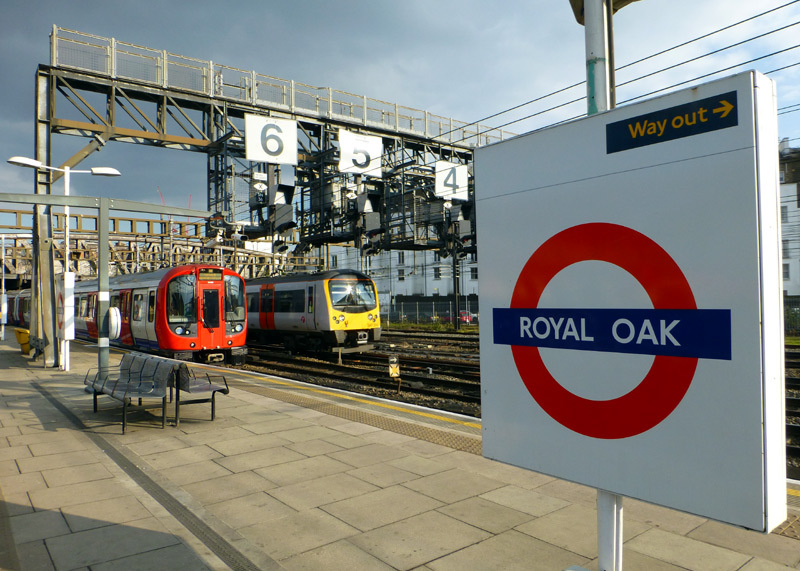 These platforms are partly in open air and the mainline trains operated by Great Western Railway / Heathrow Express / TFL Rail can be seen from them. At Hammersmith the Hammersmith & City (and Circle) Line trains use the former Metropolitan Railway station which remains largely as built in 1868. A short walk away across some busy roads is the former District Railway station which nowadays is used by District & Piccadilly Line trains and has been modernised with its main entrance now inside a shopping centre. one of the adjacent Great Western Main Line tracks is a Class 360 Heathrow Connect TFL Rail service to Heathrow Airport. 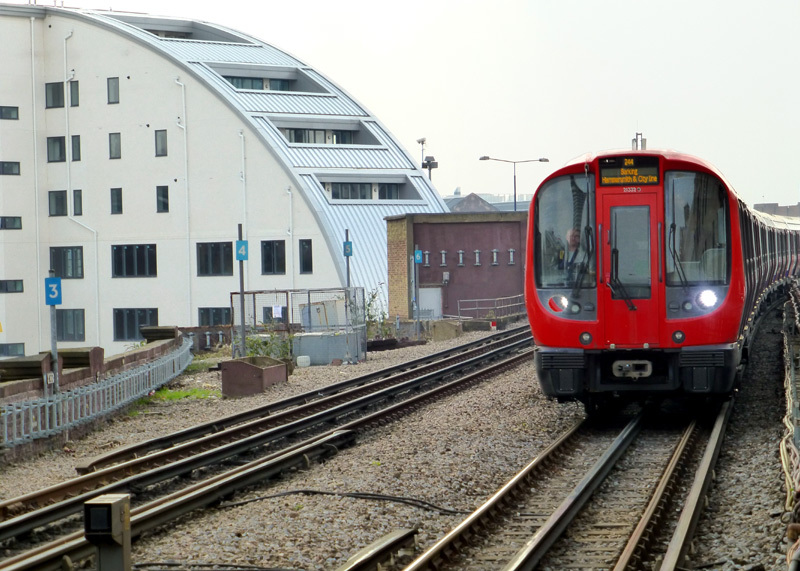 A Hammersmith & City Line S Stock train travelling towards Hammersmith crosses Freeston Road, which is a short walk from Latimer Road station. West London: Between Paddington and Royal Oak the line runs alongside the northern side of the mainline railway, and between Royal Oak and Westbourne Park the Underground trains use a dive-under to swap between the northern and southern side of the mainline trains. Royal Oak is a good location for watching passing mainline trains, including InterCity 125 High Speed Trains and InterCity Express Trains to Bristol, South Wales, Devon, Cornwall etc., outer suburban / regional diesel and electric trains, TFL Rail and Heathrow Express trains. However, because you will be looking south it will often be easier to photograph the trains when the weather is cloudy. 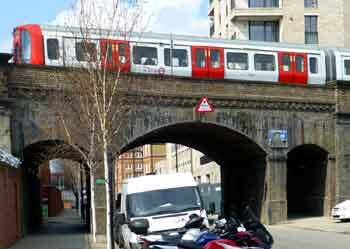 The section Westbourne Park - Hammersmith is on a brick arch viaduct which in 1864 was built by the Great Western Railway's (GWR) and served by its broad-gauge trains - these had tracks which were 7 ft 0¼ in [2140 mm] apart). Originally there were only a few stations, with more opening over a number of years. The present-day Wood Lane station dates from 2008. Over the years this station has been opened and closed several times, its 2008 reopening was because it is very near the large ‘Westfield’ shopping centre that opened in the same year. Also nearby is the Central Line‘s White City station. Just outside Hammersmith station the trains pass a small depôt. Hammersmith station was built by the Metropolitan Railway in 1868. A southbound Hammersmith & City Line S Stock train travelling towards Hammersmith approaches Latimer Road station. as it arrives at Latimer Road station. Closed Link At Latimer Road: This link was built as part of the original Hammersmith & City Railway. It went to the nearby West London Line and originally was used by GWR services which went to Addison Road station (now known as Kensington Olympia). Over the years it was used by both GWR and Metropolitan Railway services to various destinations, including the Middle Circle service which ran between Moorgate and Mansion House via Addison Road. Eventually however only Metropolitan Railway trains on the short Edgware Road - Addison Road shuttle used this link and it was completely closed in 1940 as a result of air raid bomb damage. East London: The Hammersmith & City Line joins the District Line at Aldgate East station. Some readers may recall that off-peak trains used to terminate at Whitechapel but nowadays they continue further, usually all the way Barking although it is still possible for them to terminate in the bay platform at Plaistow. 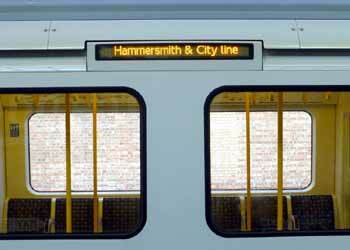 Since the introduction of the S Stock a few Hammersmith & City Line trains even travel to Upminster. This is very rare. 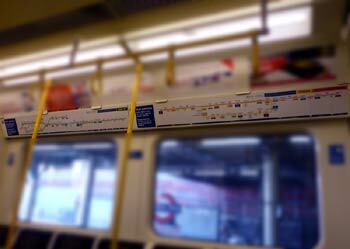 The through trains to New Cross / New Cross Gate on the East London Line are now but a distant memory. The route from midway between Bow Road and Bromley-by-Bow stations to Upminster has four (or more) tracks, the other pair of tracks are used by C2C services between Fenchurch Street and the coastal town of Southend-On-Sea. Further information can be found in the Shared Service Routes page. 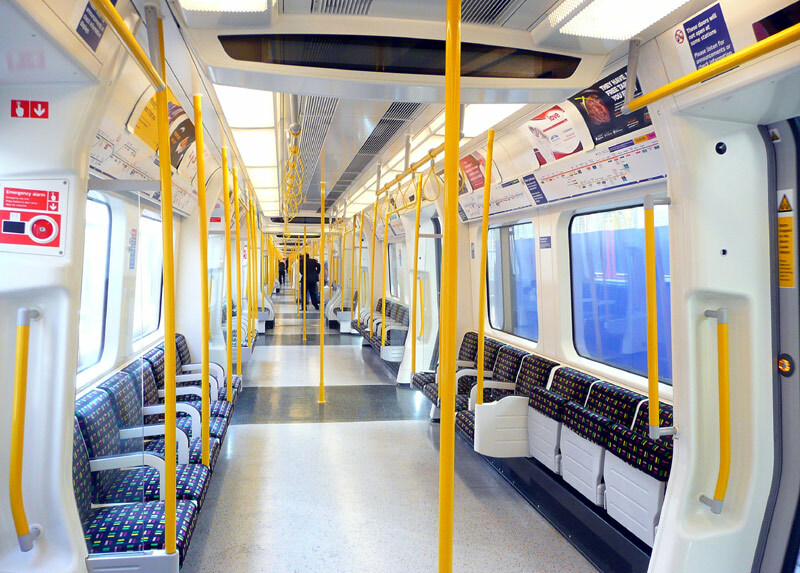 Some stations served by Hammersmith & City Line trains have short platforms where part of the train stops outside the station and the doors remain closed. Passengers wanting these stations should walk through the inside of the train to a section which is within the station platform.